We had a good run, O' Christmas tree, but the time has come to say good bye. It's bitter-sweet. Sweet because your departure means that I can get on with organizing and cleaning the house. Bitter because it means Christmas is over and you won't return for another year. As a grown up, a year doesn't seem that far away, but when I think that my boys will each be a year older - that seems crazy! Peter will probably be walking! John will be even more eloquent, independent and potty-trained (please, oh please!). A year is a long time in child-years. Today as I laid by the tree with John, I realized that I will only have 16 Christmas' left with him living in the house. Might seem like a lot, but I know it will fly by. I'm going to cling to these years like Pooh Bear to his Hunny Pot. It's been a sappy day for sure. To top it off, "What a Wonderful World" played on my Pandora station while I was rocking Peter to sleep. So tomorrow is the day, I will pack all the Christmas decorations away. Probably during John's nap. I don't want to traumatize him with de-decorating! More to come later about all the festivities. 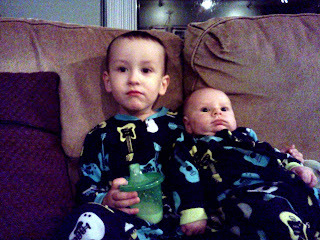 For now, here is a picture of the boys cuddled up in matching PJs (thanks Grandma and Grandpa!) watching the Grinch. I hope you took your own advice about taking down decor without the babies. Ana was very sad about saying byebye Christmas.